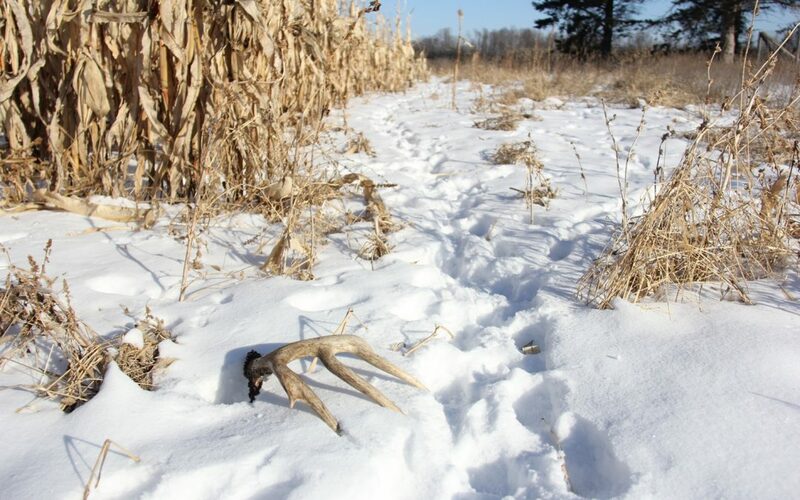 These eight tips will help you find more shed antlers this year. And this video on building a shed antler trap is guaranteed to be a real eye-opener! I found my fist whitetail shed antler purely by accident. I was setting fox traps along a brushy fencerow and there was a shed antler which had been lying there for the better part of a year. I picked it up and brought it home. Despite the fact that it was somewhat chewed up, it was clear this antler came from a big 10-point buck. I became fascinated by the amazing phenomenon of antlers. Antlers are the fastest form of animal growth known to man; they can grow more than an inch a day. Every antler is different, like snowflakes, they all have unique characteristics. My fascination with antlers led me to become fascinated with the bucks that grew them. Over time I evolved from a bowhunter who wanted to just put some meat in the freezer to someone who appreciated the challenge of shooting a mature buck. Yet I found that the antlers themselves held a curious intrigue in and of themselves. Allow me to offer some tips from a lifetime of experience that will help you find and appreciate the amazing antler. It’s easy to see the habits of deer in winter, knowing their daily patterns really helps find where the antlers are likely to be dropped. Because I started hunting shed antlers for the sake of the antlers themselves, I didn’t have any preconceived notions about their importance to my deer hunting. 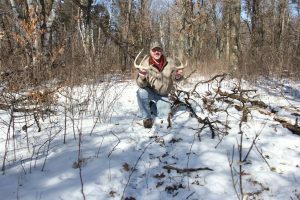 If you have read any articles about shed antler hunting, you have noticed that they all seem to relate back to how to shoot the buck that shed them. Frankly, I believe that the connection between where you find the bucks sheds and where you are likely to shoot that buck the following deer season is way overrated. In fact one of the largest matched sets I ever found was found more than five miles from where a friend shot the buck the following year. It missed making the Boone & Crockett book by less than an inch. Deer need to eat every day, and they will go where the food is. In the winter when the antlers are dropping, the food may be miles away from where that buck spends the majority of his time in the fall. Which leads us to #2. Wintering whitetails need high carbohydrate foods and they need them every day. Find the food and you will find the sheds. 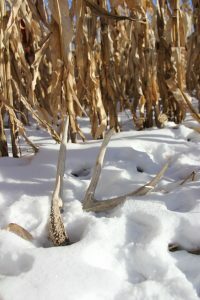 Remember the Mantra that finding sheds is all about the food. Figure out where the deer are feeding and then spend the majority of your time divided between their feeding and bedding areas. The antlers are more likely to fall off when they are feeding because they are moving about. Corn, soybeans, milo, turnips and other food plots are key to the winter whereabouts of whitetails. Pay special attention to the windswept hilltops. Snow blows off the hilltops and any lost grain from farming operations will be more accessible there. The big set of matched sheds I mentioned earlier? I found one side on top of a hill in the soybean stubble and the other side in a thick farm grove 200 yards away. Find the high-carbohydrate food in the winter and you will find the deer. There are two kinds of areas bucks tend to bed during the winter. Solar cover is the south sides of slopes that are somewhat open and allow the deer to bed in areas where the sun can warm them during the day. Thermal cover is the thickest, nastiest stuff they can find which they will use during cold, cloudy, windy and stormy weather. 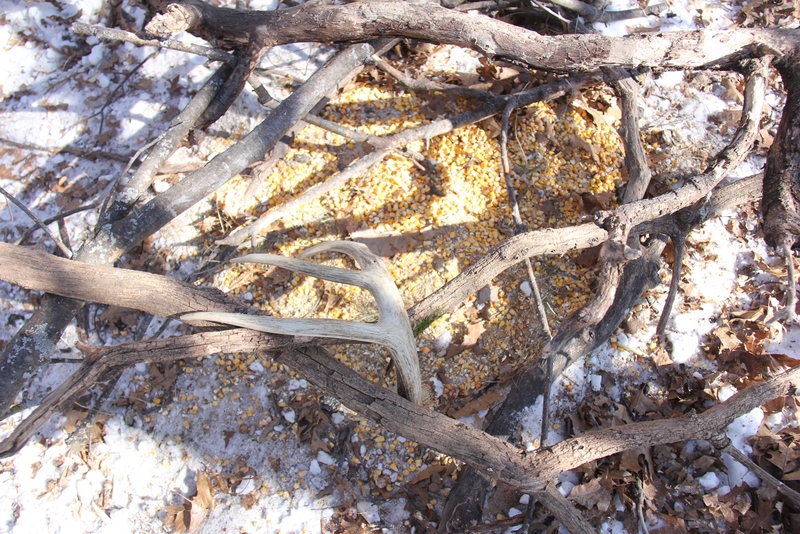 If you find these types of bedding areas within a short distance of a good food source, and you have a good number of bucks in the area, finding sheds could be like picking up Easter Eggs. You’ve hit the jackpot. Of course the deer need to travel between the bedding areas and the food. Trails will develop between these areas and the obvious sign is easy to find and follow. The more snow the better. Get out early before the snow melts and find these trails for later use. A lot of sheds can be found on these connecting trails. Pay special attention to the areas where they have to jump over fences, climb steep creek banks, etc. These areas tend to jar the sheds loose. Antlers occasionally fall of together, but that’s somewhat rare. I do believe; however, that that the buck will put quite a bit of effort into getting the other side off because of the lopsided feeling he has with one antler. He’s shake his head, rub the antler on trees and push it on the ground to work it off. If you find a nice shed, put an exhaustive effort into finding the other side. It’s probably close by. Once you find one antler, put some effort into finding the other side. They are often not too far apart. Some of the best shed hunting I found back 30 years ago when I started collecting bone was found in state parks where hunting was not allowed. Where these parks bordered crop fields on private land were often gold mines for shed antlers. The deer would feed in the fields and bed in the safety of the park. Surprisingly, most of these parks would have laws against picking any kind of plant, but nothing about collecting shed antlers. The deer would be bunched up there in great numbers during the winters which made them very fertile ground for shed hunting. Back in the 1980’s there were very few people collecting sheds. No so any more. I would wait until late March when the antlers were all cast, and the snow was mostly melted before I would go shed hunting. Then one day I was walking a deer trail in a park in central Iowa and I came over a hill face to face with another shed hunter. In his hand was the match the shed I held in my hand. This was the beginning of the end for the way I shed hunted. 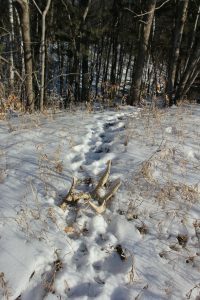 Now you must get there early and often if you are going to collect sheds. It’s become a popular sport. I could do an entire article on creating effective shed traps, but here’s the short version. A shed trap is something that causes the bucks to come back over and over, with an apparatus of some sort that increases the possibilities that the shed will drop at the site. This could be as easy as pouring a bucket of corn in a thick deadfall where the buck has to push his head in to eat, to elaborate systems of wire or bungee cords fixed above a feeder. There are ways of helping the deer drop their antler right where you can easily find them. Putting feed in a brushpile is effective. I use a simple system of woven wire in the shape of a V with some feed inside the point of the V. I do not like the use of snow fence, bungees or anything that could entangle the antler. I think it is too dangerous to the deer. The wire simply bumps into the antler as the deer feeds and when it’s ready to come off it will fall off. Hunting shed antlers can provide information that will help you with your deer hunting, mostly in the form of an inventory of the bucks that survived the previous hunting season. But more than that, it’s good exercise, good family fun and a way to enjoy one of the most remarkable things in nature; the amazing antler. Constructing a shed antler trap like the one below is not legal in all areas (Check your state laws) but it’s a fun way to feed deer and own more bone.